It's commonly known that brightly colored, tubular flowers hold the most nectar, and are particularly attractive to hummingbirds. 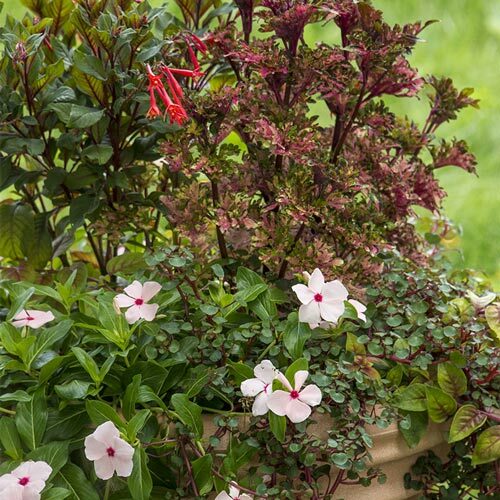 Therefore, the two forms of Fuchsia in this collection will virtually guarantee hummingbirds will visit your patio or terrace when they're in the neighborhood. Perfect for those sites where hot sun shines for part of the day, but shade moves in as well. The various shades of red, pink and green are vibrant, but the results are subtle, not garish. The foliage of the Autumnale Fuchsia just improves as summer progresses and the resulting coppery tones are beyond compare. We're in love. 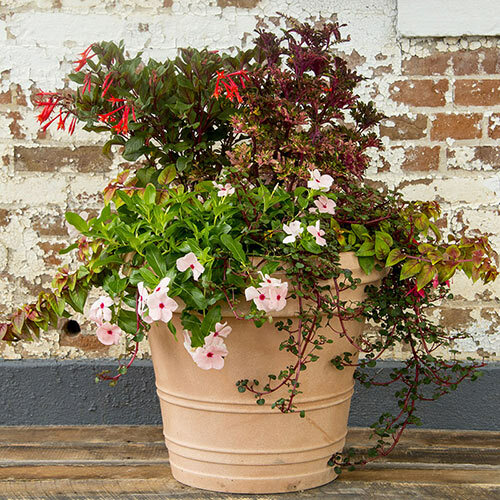 Collection contains one each (enough for a 14-16" pot) of: Gartenmeister Fuchsia, Autumnale Fuchsia, Molten Coral Coleus, Cora® Cascade Peach Blush Vinca, Gold Threads Alternathera, Yellow Canary Impatiens. Planting InstructionsCan be planted in a water side or boggy area.